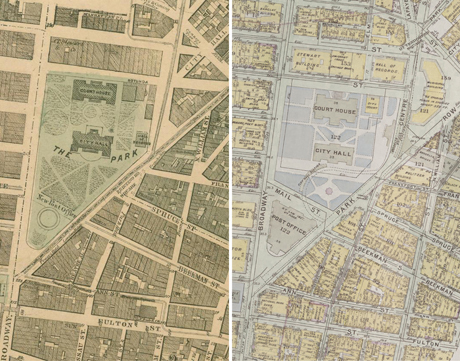 The line-up of buildings in the large photograph, looking east across City Hall Park, shows Newspaper Row around the time the writer Walter Hawkley vividly evoked its perpetual animation. 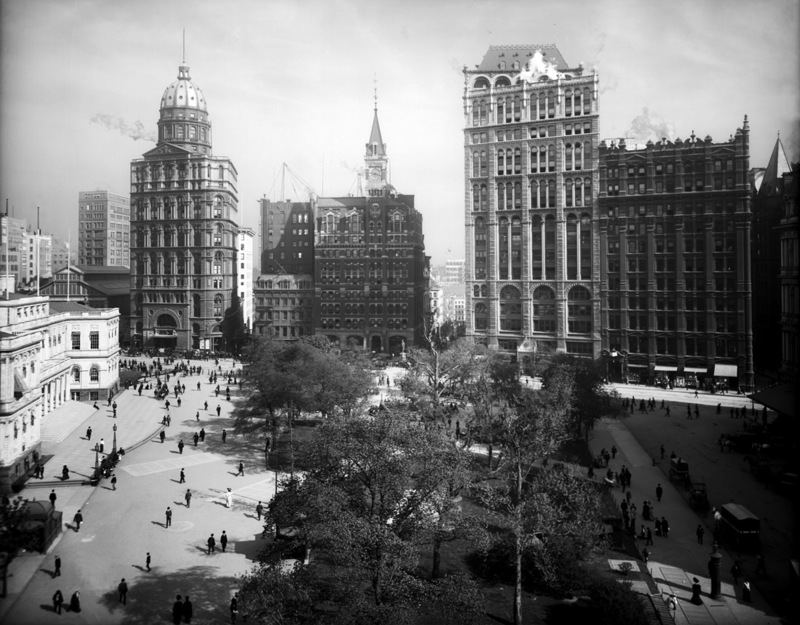 The buildings from left to right are: with the dome, the World, also known as the Pulitzer Building; the little five-story Sun which had occupied the site since the 1860s; the headquarters of the Tribune, which also leased several floors to William Randolf Hearst's Journal; and looming large in the middle-ground, the 1889 headquarters of the New York Times, which moved to its Times Square tower in 1905. To the right of the Times is the 11-story Potter Building, completed in 1883, an office building that housed some 200 tenants, including the Republican penny paper The Press. Newspaper Row flourished in part because of its many advantages of location for the production and distribution of papers. For reporters, the proximity to City Hall and the courthouses gave easy access for stories, and the main Post Office, across the street at the south end of City Hall Park, facilitated the mailing the national circulation subscription papers such the Weekly Tribune. The transportation hub of the Brooklyn Bridge debouched next to the World Building and was prime territory for newsstands and newsboys, who could also serve there the throngs of workers heading to and from the tenements of the Lower East Side. Richard M. Hurd, Principles of City Land Values, 1903, p. 158. Demand for space on Park Row drove up prices and building heights. 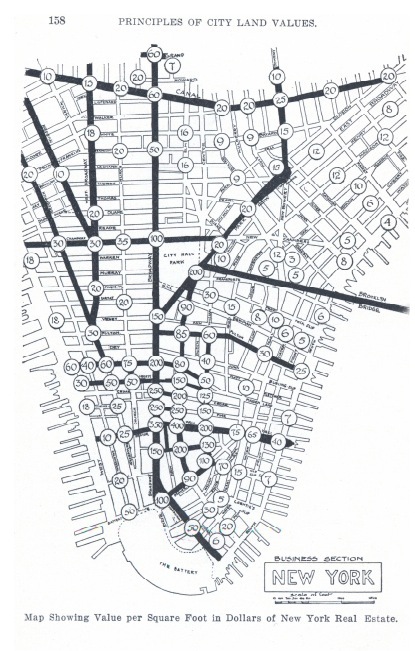 The land value map of 1903 created by Richard Hurd shows that the area of Newspaper Row was one of the most valuable districts of lower Manhattan, after Wall Street and Broadway, with prices of $200 a square foot. High land prices correlated with tall buildings. In particular, from 1903 to 1908, Newspaper Row expanded upward, as several buildings added extra stories and annexes, as the series of images on the right side of the mural illustrate.